How to keep one without gaining the other! Every day I work with people who want to reduce body fat. And when it comes to losing body fat, research indicates that changing eating behaviors leads to greater fat loss, even over exercise. Why? Because you can put 3,000 calories into your mouth in five minutes and it takes six hours to burn that same amount of calories through exercising at 500 calories per hour! So if you want to use up the fat on your body, it is a wiser strategy to change your eating. It will yield higher returns with less time invested. That said, we live in a society where food is everywhere! So, we have a dilemma: we want to maximize the amount of food we eat while at the same time minimizing the amount of fat we carry on our frames. The usual strategy is to focus on what we are eating and cutting out anything pleasurable until we lose weight or just give up and go back to choosing the wrong foods. So, how can we live with food, enjoy it and still keep a pleasant body fat level? In my work with clients, I have learned that it isn’t just what you eat, but several other lifestyle patterns involving food that can eliminate the choice of having your cake or your bathing suit! Most of my clients who are struggling to lose weight have a similar eating schedule. They tend to skip meals or under-eat meals during the day and then overeat at night after 6pm. Research on normal-weight individuals shows that they consume about 75% of their daily calories before the hour of 6pm. Over-fat individuals consume about 45% of their calories before the hour of 6pm and ingest 55% from 6pm until bedtime. I have helped many people successfully lose fat by designing an eating frequency plan where they actually eat more during the day. Generally, you should eat every 4-5 hours throughout the day and take in about 300 calories per meal (women) or 400 calories per meal for men. That gives you five meals each day where you can enjoy good tasting food while achieving a healthy body fat level. Of course, these numbers are generalizations because individuals have varied calorie burn rates, but the bottom line is that eating frequently and consistently while utilizing portion control is the way to go! Eating should be kept to very limited places in the home. The more places you condition to have food, the more places you will have to fight the triggers to eat….even when you are not hungry! For the most part, I suggest eating only in the kitchen/dining area, never in the TV room or the bedroom. Once those spaces have been linked with food, it is very difficult to remove the drive to eat as part of your “go to sleep ritual” or your “TV-watching ritual”. I also advise my clients to avoid eating in the car. If you get take-out, then eat it when you get home or back to your office or on a park bench. Do not link eating to being in your car. We spend too much time driving to afford this place as a conditioned response to eating! Another pattern to break is eating when standing up: like when you have your head in the refrigerator and are taking bites of leftovers or when you are standing at your kitchen counter preparing a meal. A good rule to follow is to eat only when sitting at a table designed for meals. I also like clients to eat their lunch away from their work desks. Again, we spend too much time here for it to be linked to eating. We are usually stressed at work and stress and eating is definitely not something you want to link in your nervous system! By minimizing the places that you habitually ingest food, you unconsciously streamline the number of places in your daily life that you get unconsciously triggered to eat! Speed may be good in many areas of our lives, but when it comes to eating, speed is a sure path to weight gain. It takes some time for our brains to get the message that enough food has entered our body and that we can stop eating. For many of us, by the time that message is delivered, we have inhaled hundreds of calories. Here’s something to try: Set a timer for 20 minutes and make a portion of food that is appropriate for dinner to last that long. Just try this once and it will be an eye-opening experience. You will be satisfied with less food and will avoid that over-stuffed feeling that happens when your brain signal and stomach catch up to each other! This topic would need more than just a paragraph or two to fully address. What I want to highlight is that for almost all of my over-fat clients, food is the primary relationship in their lives. Food, of course, is necessary to survive. Just like water, it needs to be a priority, but very few people have their social calendar revolve around drinking water (I won’t discuss alcohol here!). Instead, many of my clients make social plans with eating as the main activity. For instance, people make the food at the party the primary focus or think about the special foods that they will be eating on vacation or can’t go to a movie without eating in the theatre, even if just coming from dinner! 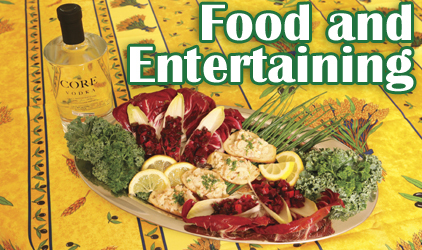 You must take a hard look at how you are using food as entertainment and not as a necessary and enjoyable enhancement to the rest of your life! Food and eating are pleasures that we engage in several times a day, every day of our lives. The problem is that when daily habits with eating run amok, the pleasure of food gets converted into added fat on our bodies and that robs us of the pleasures of hugging another person, riding a bike for the joy of it and just being in our body in everyday movements. But, if we modify our eating patterns, then we don’t necessarily have to cut out all pleasure from eating and still be able to feel comfortable in our own skin! Judy Torel is a USAT coach, personal trainer, nutrition consultant and psychotherapist. Her office is located in Planet Fitness, Loudonville. She can be reached at 469.0815 or jtorel2263@yahoo.com. Below are sample mini-meal ideas. Cook 8 ounces of egg whites in the microwave for 3 minute and divide into 3 columns with knife (120 calories). Take 3 corn tortillas (55 calories each) with .5 ounce of 1% fat shredded cheese (90 calories total) in the microwave for 45 seconds. Take 1 handful of baby spinach per tortilla (20 calories) placed on top of melted cheese. Place one of the egg white columns on top and roll into a burrito…put into transportable container for later or enjoy now! Microwave 5-ounce potato until soft – cut open and gut out about 2 ounces of potato. Mix one pouch of Bumble Bee Salmon pouch (160 calories) with 3 ounces of plain fat free Greek yogurt (50 calories) and garlic powder. Combine salmon with inside of potato and shredded carrots and cubed red or orange peppers. Re-stuff the potato with the salmon-veggie salad ….put into transportable container for later or enjoy now! Spread Laughing Cow lite cheese wedges (105 calories) on 16 Nut Thin crackers (130 calories) with 5 ounces of any fruit. Mix 6 ounces of Cabot non-fat cottage cheese (100 calories) with 1 tablespoon of almond butter (90 calories) and 2 tablespoons of Polandar Fruit Jam (60 calories) and spread onto graham crackers (100 calorie portion). How to really boost your metabolism this spring!